Courcelles is a station on Paris Métro Line 2, under the Boulevard de Courcelles on the border of the 8th and 17th arrondissement of Paris. The station was opened on 7 October 1902 as part of the extension of line 2 from Étoile to Anvers. The Boulevard was named after the Barrière de Courcelles, a gate built for the collection of taxation as part of the Wall of the Farmers-General; the gate was built between 1784 and 1788 and demolished in 1859. The gate was named after a small village in the area that was absorbed into Paris in 1860. Fulgence Bienvenüe, father of the Métro, lived near this station. 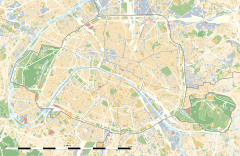 Wikimedia Commons has media related to Courcelles (Paris Metro). This page was last edited on 9 January 2018, at 08:00 (UTC).